Whenever I say Chinese New Year, my husband corrects me: “It’s Vietnamese New Year.” Lunar New Year is the same day as Chinese New Year, usually the second new moon of the year, but it’s Vietnamese New Year or Tết to us. To celebrate the Lunar New Year is to ăn Tết—literally to eat the New Year. Every year we eat a lot of Tết—and it’s delicious. 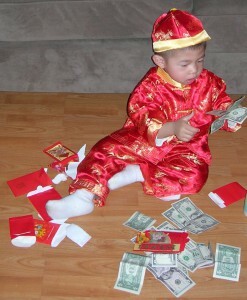 But for the kids, Tết is all about the red envelopes filled with lì xì or lucky money. The only problem is that to get lì xì they have to line up and stand in front of their elders and think of a sincere wish of health and happiness in the New Year for each. I thought my kids were intimidated because they thought they had to say something in Vietnamese and they could only mumble, “Chúc mừng năm mới. Happy new year.” Writing about my husband’s childhood, I found out that he used to be terrified of facing grown-ups and having to think of something to say. But he really wanted the lì xì for buying firecrackers or embryonic duck eggs in the market, so he tried to mimic what his older brothers said. This Tết my husband’s oldest brother, Vân, was teasing his four-year-old niece that she tried to wish him twice and get another red envelope. “What about the time you and Lượng and Thượng went across the street and wished the old widow three times?” I asked. Chúc mừng năm mới. Health and Happiness in the New Year and always. 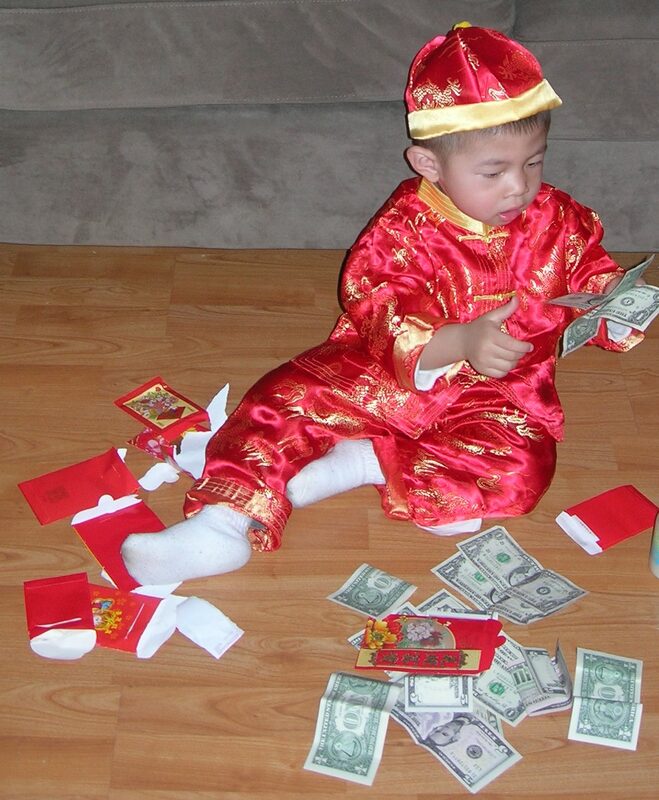 I use red envelopes in giving away lucky money to kids during new year too. It’s something Filipinos have picked up from Chinese immigrants. Oh – you’ve eaten duck egg embryo? I didn’t know that Filipinos had picked up the red envelope tradition. Lucky for the kids. I have tried duck egg embryo, but it’s not my favorite. Do you call it balut over there?